#5431073 5305431073 Washer Pump Seal Kit for Frigidaire - Vintage and RARE! Here's a hard-to-find part for those great old 'solid-tub' Frigidaire clothes washers. No longer available since July 2003, I had just ONE left here, but just sold it (7-27-12)! 'Will be looking for more, but they're really scarce these days. Replacing this pump seal was a common repair on these machines. It's pressed into the pump cover with a bit of silicone caulk around its perimeter. 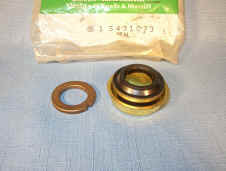 This one includes only the seal, and NOT the rotating bronze ring that fits into the impeller. But it's nearly always this boot portion that fails, and the bronze ring can usually be cleaned and reused, or even flipped over to get to 'fresh' bronze. I had to get $34.50 for this last one plus $5.00 Priority shipping, $39.50 total. There should be another one sitting on a shelf somewhere, so I'll keep looking. Drop me an email if you'd like me to let you know when I find another one.